1/4 of a wavelength of light, no light will be reflected which is characterized by a black part (see picture). This demo takes a while to setup. 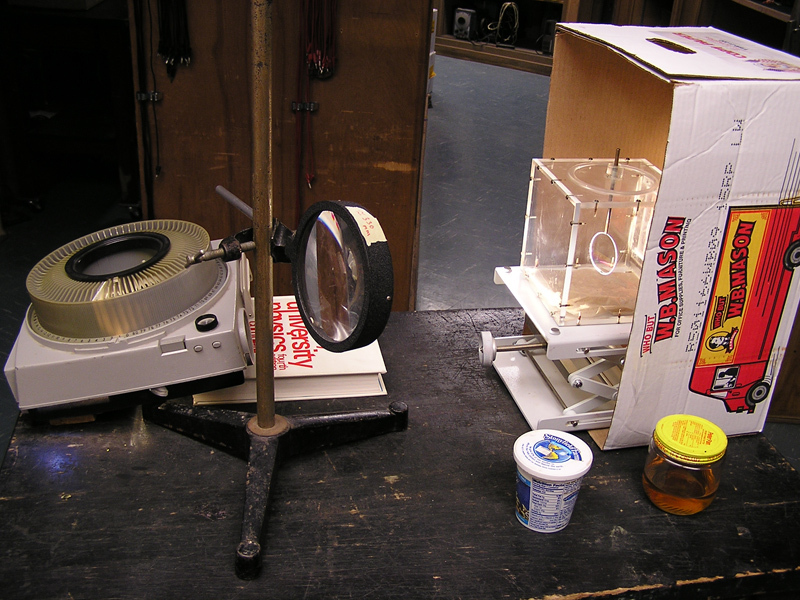 Place a jack stand inside the box (to shield students from the bright light). Place the bubble chamber onto the jack stand. Wet a paper towel and place it in the bottom of the thin film apparatus. Put the cover on and wait a minute for the chamber to get moist. Setup the slide projector to aim at the bubble chamber. Use a book to prop the slide projector up if needed. Setup in the room. Aim it so the reflection of the soap film will go on the screen. Dip the bubble wand into the soap. Place it back in to the bubble chamber. By hand, poistion the lens in front of the reflected light path. Your goal is to try and find a spot where the image looks decent. When you find this spot, attach the lens to the portable stand. Make small adjustments until you get the best image possible (see top picture for an example). Turn the slide projector to fan only for a few mintues untill you shut it off fully (so it does not overheat). The setup should look similar to the above picture. Take careful notice of how the bubble wand is positioned. Turn the slide projector on. Remove the bubble wand and dip it in the soap. Place the bubble wand back into the bubble chamber like it was positioned before. You may have to make slight adjustmetns. Some soaps require you to wait a minute. Note the image on the screen. Explain that the image is upside down (this is why the black occurs at the bottom of the image). When finished, turn the slide projector to fan only mode. Let it cool off for 5 minutes. After the exhaust air is cool, turn the slide projector off. Note: Diffrent soaps work diffrently! 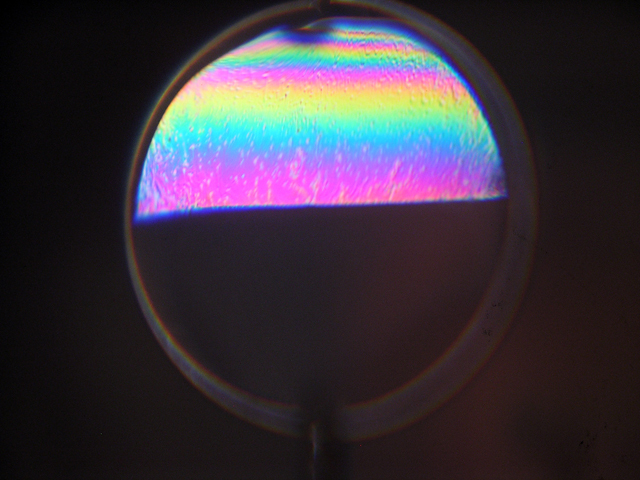 Some exibit thin film interference from the start, while others take a minute. a wet paper towel in the box increases the humidity and increases the life span (sometimes as much as 15minutes). Setup Time Warning: This demo takes a while to setup because it is hard to focus the image.